Millions of Indians wait for the monsoon every year. The rains from June to September is important, even critical, to some of the most basic parts of the economy - farming, cattle rearing - and also for providing drinking water. But this year, just like the last, the season has disappointed. So far, the rainfall has been 12% below the average of the last 50 years (that's the standard used to evaluate monsoon). The number masks deep distress in several regions. Marathwada, for example, has received only half of the rainfall it normally receives. In north Karnataka and central Maharashtra, the shortfall is 40% and 35% in the fertile Punjab-Haryana-Uttar Pradesh belt. In all, 15 of the country's 36 weather zones have received 20% less rain than normal - that's the biggest shortfall in at least half a decade. Record-low rains in several regions such as Marathwada present a humanitarian crisis - lakhs spend the season without a regular supply of drinking water. Nearly half of India's districts received deficient or scanty rainfall from June until 26 August, according to the Indian Meteorological Department. That's the time when the country gets most of the monsoon rainfall. In August itself, rainfall was 25% below normal. And the deficiency comes on the back of a similar situation last year, especially in Marathwada, Telangana, Uttar Pradesh, Haryana and Punjab. July and August are also critical in the growth of summer crops such as rice, gram, cotton and crops used as fodder for animals. "The impact of this on agriculture will be significant as crops are entering vegetative phase when they need substantial rainfall," said Sonu Agrawal, founder and managing director of climate management company Weather Risk. About 65% of India's cultivated land is not irrigated. Even in areas with irrigation, many depend on storage reservoirs, which are again rain-fed. As of 27 August, 91 important reservoirs were only 58% full - lower than last year as well as the the average for the last ten years. Maharashtra, Telangana, Karnataka and Kerala are among the states who have less water stored than last year. The impact of the below-average monsoon will be felt the most in Bihar, Uttar Pradesh, Karnataka and Maharashtra, according to an analysis by research and ratings agency Crisil. A third of the country's food grain is produced by these states. Agricultural growth has anyway been sluggish. It's a double whammy, according to Crisil, as industrial growth has been disappointing. Last year's monsoon deficit (12%) led to a spike in inflation, but that was arrested due to some measures taken by the government such as lower increases in minimum support price of crops. But such measures can't always be taken without making structural improvements to Indian agriculture, says DK Joshi, chief economist at Crisil. "Investing in Indian agriculture's future has become economically and politically critical. The government needs to change the templates, and quickly so." Among the regions that need quick intervention, perhaps Marathwada is the worst-hit. The region has been notorious for shortage of drinking water due to recurrent droughts and faulty water policies of the state government. While last year, Marathwada received 42% of normal rainfall, this year there is a a 50% shortfall - the worst in the country. The situation is dire. Residents of Latur, for instance, receive municipal water supply only once in 15 days, according to the South Asian Network of Dams, Rivers and People (SANDRP). 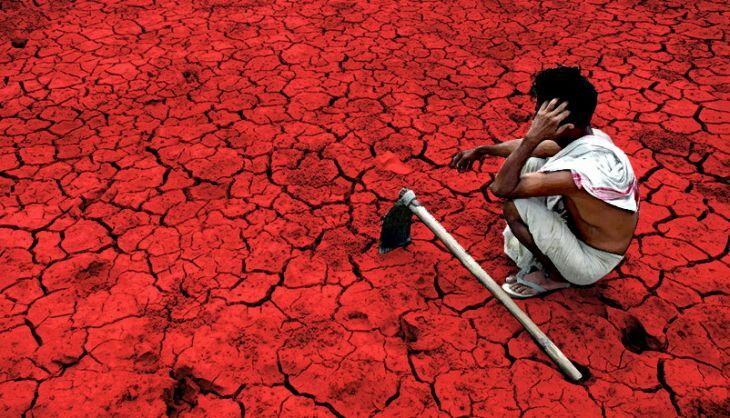 While governments usually wait until after the end of September (official end of the monsoon) before declaring drought, the Maharashtra Government is reportedly planning to declare it in mid-September so that relief can be sent to those in need. The state government is also considering banning sugarcane crushing and cultivation - as the processes need huge amounts of water - in the region.